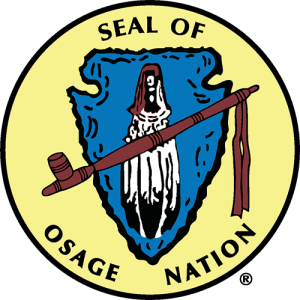 Osage Nation originally named Ni-u-kon-ska or People of the Middle Waters is a federally recognized tribe with headquarters in Pawhuska, Oklahoma and has tribal jurisdiction in Osage county, Oklahoma. The current governing body of the Osage Nation contains three separate branches; an executive, a judicial and legislative branch. Legend indicates the Osage and the other Dhegiha Sioux (Kaw, Omaha, Ponca, and Quapaw) originated at Indian Knoll near the mouth of the Green River in Kentucky. By 1200 A.D., both the Osage and the invading Iroquois left the “dark and bloody” ground of Kentucky. Bits and pieces of evidence indicate there were probably three routes of Osage immigration into the trans-Mississippi West. During the move to reach their historic locations all of the bands kept close contact with their clans and gentile systems, which acted as the bond holding the Osage together as a people. In the long war to stop the Iroquois’ movement from the Northeast to the Old Southwest the Osage had formed an alliance with the Illinois. Two of the Illinois clans had merged with the Osage. Both this merger and the long Kentucky war had revolutionized Osage government and their military organization. Like the Osage once were, the Caddo speakers who were native to the area were basically a peace-loving people. Like the Osage, they were forced to become warlike in the face of the Osage invasion. By 1750, the Osage had established control over half or more of Missouri, Arkansas, Oklahoma, and Kansas. Possibly over a thousand or more Osages resided in Oklahoma by 1800 in small villages. Osage village and campsites were favored places for later settlements; the sites were cleared and lay within the network of Osage trails that later became the highways of today. In 1839, to end Osage-Cherokee hostilities the U.S. government forced all Osage bands to be removed from Arkansas and Oklahoma. These bands were relocated to Kansas part of Indian Territory where the Missouri Osage had agreed to settle in 1825. In 1871, the removal back to Oklahoma from Kansas was the third displacement within forty-six years. Though the previous removals were bad, the 1871 expulsion was worse in terms of lives lost and hardships. This move almost destroyed the Osage people. The Osage economy relied heavily upon hunting and gathering, but they had a sizable agriculture and an extensive trading system. Income mainly from grazing leases caused the commissioner of Indian affairs to call the Osages “the richest people on earth.” Petroleum income did not become a monetary factor until after Osage allotment in 1906–1907. However, Osage grass-leasing regulations made an easy transfer from grass to oil leasing. By the 1920s the commissioner’s comment had come closer to the truth. Allotment brought a division of the Osage Trust Estate. This financial estate came from treaty settlements, land sales from the Kansas Reservation, and accumulated interest on money held in trust by the United States. This was distributed to each living Osage in the amount of a little more than ten thousand dollars each. Income from grass and mineral leases were distributed quarterly on a per capita basis to those who had been living in 1907. In addition, each headright holder was allotted just over 640 acres in Osage County, Oklahoma. Unlike other reservation allotments in Oklahoma, there were no surplus lands after Osage allotment. The Osage had purchased their reservation and owned it. Osage County never came under the Homestead Act of 1862. Osage prosperity attracted money-hungry outsiders. The Reign of Terror, in which a number of Osage were murdered for their petroleum wealth, ended only when the newly formed Federal Bureau of Investigation (FBI) won a conviction in federal courts. The Osage Murders was the FBI’s first homicide case. Since then, stereotypes and exaggerated stories about rich Indians and books about the murders have held the center stage in Osage-related literature. However, little has been said about the majority of the Osage people, who were busy giving their children the best education money could buy, who worked hard to produce beef for American tables, who firmly backed their state and nation in both war and peace. The Osage allotment is full of firsts. Separation of mineral rights from surface rights by federal law first occurred in the Osage oil fields. Most Oklahoma history texts mention that the Constitutional Convention of 1907 had delegates from Oklahoma Territory and Indian Territory but have neglect to note that the Osage Tribe also had two convention delegates. Since the turn of the twenty-first century the Osage people number about 15,000. More than ever before, Osages hold graduate degrees. Language and craft classes are held throughout the year at several locations, including the Osage Tribal Museum in Pawhuska and the White Hair Memorial, an Oklahoma Historical Society facility near Ralston. Most of the old Osages have died with only four of the original 2,229 Osage allottees alive in October 2003, which means that a new generation now leads the people. The Osage tribal headquarters is located in Pawhuska, Oklahoma and has tribal jurisdiction in Osage county, Oklahoma. Osages were originally in what are now Missouri, Arkansas, and Kansas and they were removed to what is now Osage County in the late 1800s. In spite of their circumstances they were able to hang onto their language and ways. As time passed, the “pure Osage” language was diluted by European influences. Osages who were born in 1906 and later were sent off to boarding schools, while there they were forced to quit speaking Osage and speak English. Speakers between 1906 and 1940 continued to hear and speak Osage in their homes, but they took up more English and European ways. Osages who were born from 1940 forward had English as their first language; they heard Osage spoken. The language diluted even more and much of the meaning was lost. Many attempts have been made to keep the language alive. These attempts have laid a foundation of words and developed an ongoing interest to learn and preserve the language. Unfortunately, no fluent speakers were developed. Currently, there are between fifteen and twenty second language speakers and elders, who are able to speak or pray at a meeting or cultural activity. Due to the efforts of our previous tribal council and new Constitutional government, we are on the road to preservation and revitalization. In the fall of 2003, the council created the Osage Language Program and hired Mongrain Lookout as the director. Their efforts have proven successful. We currently have five advanced student who have made tremendous progress toward fluency and approximately 300 currently enrolled in the tribal program classes. Mongrain is constantly evaluating and making the effort to upgrade the teaching methods and techniques in order to help students learn the language more efficiently. We will continue to make an aggressive effort to revitalize the Osage language. Because of what we have experienced so far, we know that it can be done. We can’t quit; our future depends on it. The Osage Nation issues its own tribal vehicle tags and operates its own housing authority. The tribe owns a truck stop, a gas station, and ten smoke shops. In the 21st century, it opened its first gaming casino and as of December 2013, has seven casinos. The Casinos are located in Tulsa, Sand Springs, Bartlesville, Skiatook, Ponca City, Hominy and Pawhuska. The tribe’s annual economic impact in 2010 was estimated to be $222 million. Osage Million Dollar Elm, the casino management company, is encouraging employees in education, paying for certificate classes related to their business, as well as for classes leading to BA and master’s business degrees.